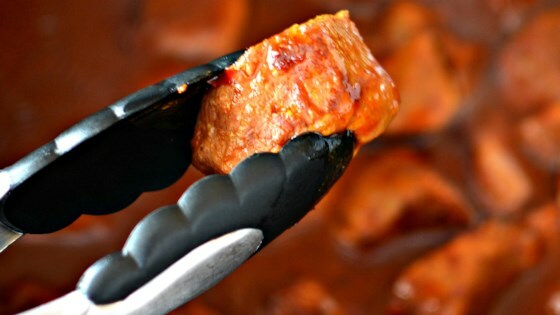 "Chunks of pork shoulder smothered in an easy-to-make New Mexico red chile sauce and pressure cooked to succulent tenderness. Perfect for taco or burrito fillings." Place New Mexico chiles in a heat-proof bowl. Bring chicken broth to a boil in a small saucepan. Pour over the chiles; left soften, about 30 minutes. Turn on a multi-cooker (such as Instant Pot(R)) and the select Saute function. Coat pork with flour and add to pot in batches; saute until golden brown, about 15 minutes. Transfer soaked chiles to a blender. Add broth, garlic, and chipotle peppers; blend until smooth. Combine blended chile sauce, onion, vinegar, salt, oregano, and cumin in a bowl; pour sauce over the pork. Close and lock the lid. Select high pressure according to manufacturer's instructions; set timer for 20 minutes. Allow 10 to 15 minutes for pressure to build. The sauce thickens as it cools a bit but if your sauce is too thin set your pot on Saute for 5 to 10 minutes to let some of it evaporate, or make a slurry by mixing 1 tablespoon cornstarch and 3 tablespoons water and pour into the pot. Let it boil on Saute until thickened. The only thing I added was to de-glaze the pot with red wine before putting the meat and sauce back in. Served with Mexican cabbage pico de gallo on flour tortillas. Very flavorful. I didn't have New Mexico peppers, but small, dried Japanese red peppers gave it a lot of heat. It made a lot of sauce for the amount of meat, so leftovers became a soup.